"Both in town and site planning it is important to prevent the complete separation of different classes of people which is such a feature of the English modern town." 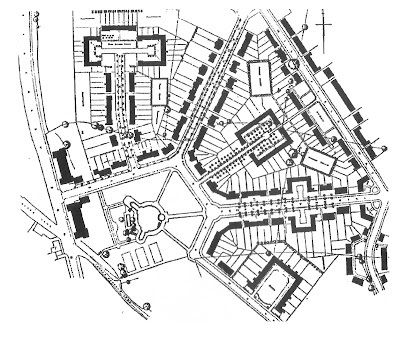 "It is not within the power of the town planner to alter the prejudices of people, or to prevent the growing up of the East End and West End in a town.....(but) there is nothing in the prejudices of people to justify the covering of large areas with houses of the same type and size. The growing up of suburbs occupied solely by any individual class is bad socially, economically, and aesthetically. It is due to the to the wholesale and thoughtless character of town development, and is quite foreign to the traditions of our country; it results very often in bad municipal government and unfair distribution of the burdens of local taxation, misunderstanding and distrust between different classes of people, and in the development of and exaggeration of differences of habit, and thought; it leads, too, to a monotony of effect, which is as depressing as it is ugly. In the English village we find all classes of houses mingled along the village street or around the green, from the smallest labourer’s cottage to the large house of the wealthy farmer, doctor, or local manufacturer….."
"If then, the site that is being planned is one which we expect mainly to have working-class population, we should try to arrange some attractive corner in which a few rather large houses may be built; we should induce the doctor to live among his patients by affording him a suitable ……. among those not so fortunate."